Measurements: 3.15 x 4.9 inches; or 80 x 125 millimeters. Largish. Back of card: Solid gold field, thin black line around the edge, the single word, "Symbolon" incorporating male/female angels embracing in the upper third of the card. Seems like inversion is going out of style. Booklet included: Yes, 121 pages, 3.1 x 4.95 inches, or 79 x 125 mm. This is a full book, each card gets a full page. In the back are tiny illustrations of the entire deck. Comments: Though there are tarot-inspired cards in this deck, this is not a tarot deck. There are no major arkana, no minor arkana, no suits, no court cards. In the corners of each card are their astrological symbols. 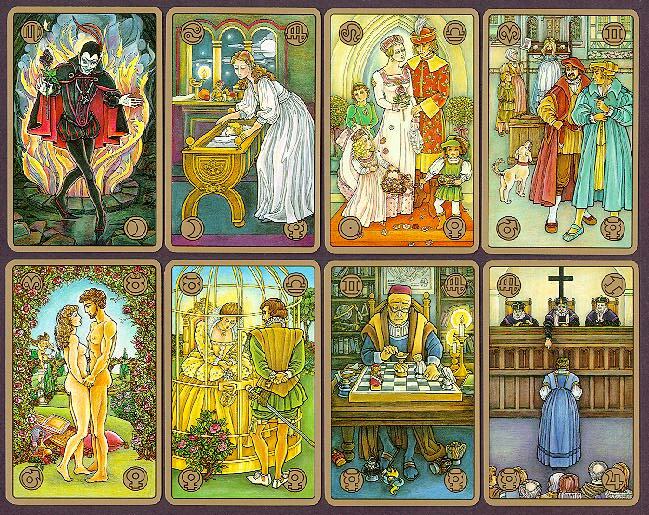 There is one card for each of the 12 signs of the zodiac, each with the ruler of the sign (Uranus = Aquarius, Neptune = Pisces, Pluto = Scorpio), though you'd swear their symbol for Pluto is the same as their symbol for the moon (top left card above, Scorpio). The remaining 66 cards are based on pairs of signs (given in the upper corners) with their rulers (given in the lower corners). These are based for the most part on European history & myth & include a woman condemned for adultery, another in stocks. There was once more to these notes, but they were lost in an unknown computer crash. When I have time, I will try to reconstruct them.